The OmniCure AC8-HD air-cooled, UV LED curing systems deliver an outstandingly high optical dose, bringing UV LED curing to the next level. The AC8-HD Series of products are designed with a patented technology that enables unbeatable uniformity of output across the irradiation area. 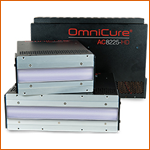 The OmniCure® AC8150P-HD, AC8225P-HD and AC8300P-HD air-cooled, UV LED curing systems deliver an outstandingly high optical dose, bringing UV LED curing to the next level. The AC8-HD Series of products are designed with a patented technology that enables unbeatable uniformity of output across the irradiation area. Delivering over 15W/cm2 peak irradiance and double the dose of the standard AC8 Series of products, these systems are ideal for applications that demand high dosage. Offering three standard cure widths – 6” (150mm), 9” (225mm), and 12” (300mm), the AC8-HD systems can be adjoined to customize and achieve countless curing sizes without any compromise in uniformity. Excelitas Technologies’ patented process for addressing individual UV LED module outputs not only enables exceptional uniformity over the entire curing area, but also empowers customers with the ability to customize outputs and benefit from tighter process controls. With the high UV LED output, the AC8-HD Series can support an expanded range of applications, as well as an increase in process speeds. Available in 385nm, 395nm, and 405nm wavelengths, the AC8150P-HD, AC8225P-HD, and AC8300P-HD also bring RS485 functionality for greater flexibility and ease of integration. Multiple wavelength available in 385nm, 395nm, and 405nm.